Marcus Coochwykvia has been working as a Silversmith since the 1970’s. Trained to make jewelry first by his brother-in-law Glen Lucas, then Roy Talahaftewa and through his association with Hopicrafts, Marcus appears in many books on Native American jewelry. He lives in Mishongnovi and is a member of the Bear Clan. Although some of Marcus’ pieces have a hallmark of a Bear Paw with Friendship Marks in the pad, some just have his initials MC. My belt buckle has both marks. First thanks for your site..Very nice.. 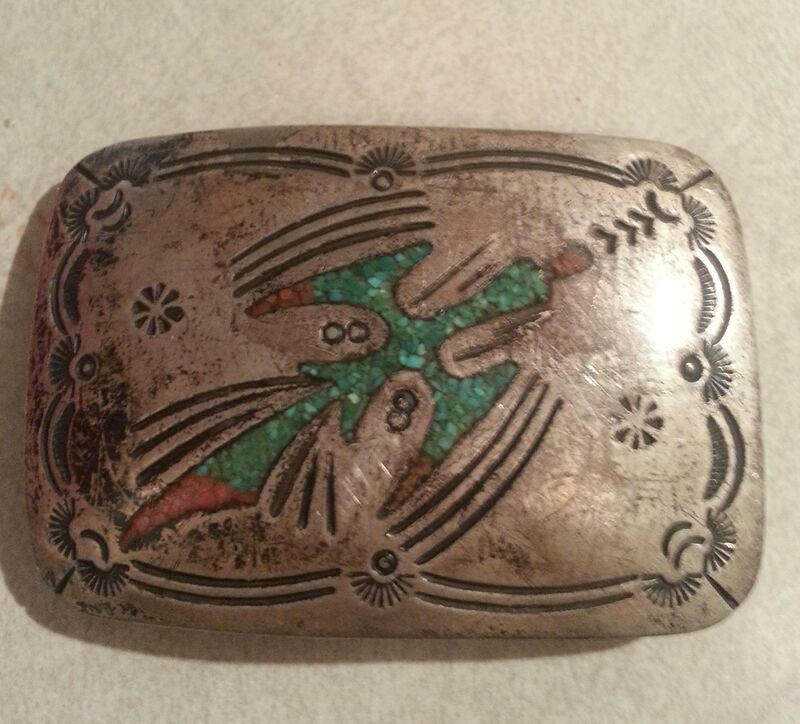 I have a Hopi belt buckle I purchased around 1986 at a gallery / art center on 2nd Mesa….I believe the hallmark is an R & A combined , where the bottom of the R has a horozontial line to look like an A ..Any idea who that might be.? What a GREAT buckle !! According to Hopi Silver by Margaret Nickelson Wright, that hallmark is attributed to Ramon (Albert Jr.) Dalangyawma who began silver work in 1978. He learned silversmithing at Hopicrafts which was a private enterprise from 1961-1983. Ramon (Albert Jr.) Dalangyawma has a Navajo mother and Hopi father. Giant one pound turquoise buckle by Mary Livingston – what’s it worth? I have a piece by Mary Livingston that measures about 4 x 6 x 5/8″. 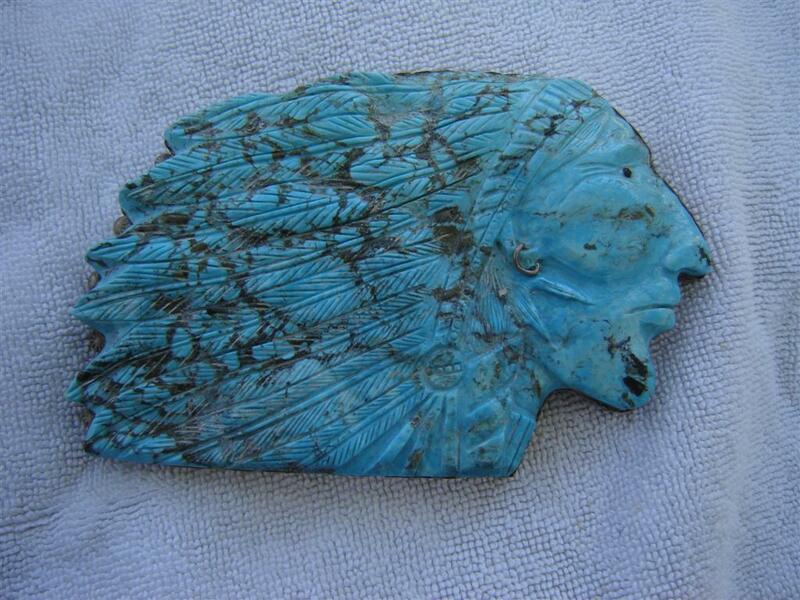 It’s one solid piece of turquoise with red veining carved into an indian chief face with a full feather headdress. 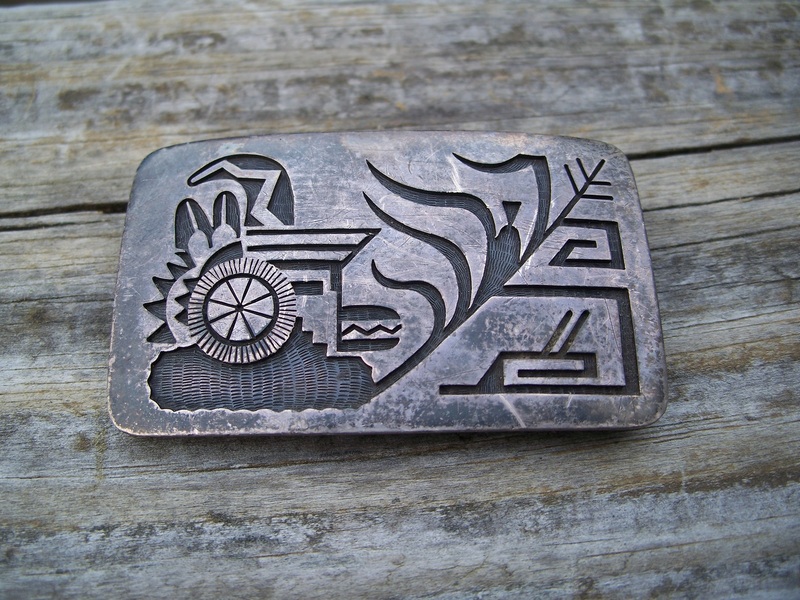 It’s setup to be a belt buckle, backed and bordered by silver. It weighs 1lb 2 oz. I’m interested in selling it and I’d like to know what it’s value is. Let me know if you’d like a picture. Thank you for your query about selling your Native American jewelry. We receive many e-mails each day and we don’t know who has read the information on our website about selling jewelry. So that is why I ask………Have you had a chance to read this article? If so, please send a photo of your item with your asking price. I’ll let you know if your expectations are within our budget and if we should proceed. We don’t make any offers via photos but they help us determine whether the items are appropriate for our store and whether you should ship them to us for a formal appraisal. To help you determine the market value of your item, read this helpful article. Attached are the requested photos. Re my “asking price”, I haven’t a clue and my inquiry to you is an attempt to figure that out. Per your suggestion, I combed Ebay extensively and there’s simply nothing comparable to this piece, sold or not sold. I found a site that gives ballpark pricing per carat on various grades of turquoise, but other than the top grades that mine is obviously not, it’s hard for me to determine where mine falls. So any light that you can shed on that will help move me toward figuring out fair pricing for making a deal with you, if you are interested. That is truly a unique buckle John. I can see why you couldn’t find comps !! I took a 4 x 6 tablet I have here and held it over my belt buckle and WOW, that is a big daddy, and as you say, heavy. I’m not sure it would ever be worn, so it would be something someone would purchase to “collect” and admire more as a piece of art rather than a functional belt buckle. It seems to be made for the non-native buying public as the Indian heads are not a traditional design that NA artists would make for themselves or their families. It would be made for sale I would guess and probably was a special order. Mary Livingston, a Navajo, usually does Zuni style inlay so this is quite a departure for her. Did she make it for you? Or did you purchase it second hand? Sometime the provenance helps a bit too. I’m at a loss as to its worth too, although your photos are good, it is hard to tell the quality of turquoise from a photo. If you come up with a price, let me know. Best of luck with it !! I could post it on my blog to see if anyone has any comments or knowledge on its value. By all means, post it on your blog. I’d love to find out more about it. I thought it was kind of an odd choice of subject for a NA artist to take on. And the shear size of the thing didn’t look like anything I’d ever seen in NA turquoise jewelry. A good to average grade are with proper color, matrix balance, etc, cost about $2 to $5 per carat. Is this way out of whack? Figuring there is give or take one pound of turquoise…..
Let’s see what others say………..I know $5000 is out of our price range ! I now have the buckle here in person. After all of us here at horsekeeping examined the buckle closely and I showed the buckle to a number of my colleagues……..here are some thoughts. Mary Livingston is a Navajo that does work in a Zuni style. The consensus is that it is a hand carved Navajo buckle made from stabilized turquoise OR compressed and fracture sealed stone. Most felt it was from one piece of turquoise that had been treated in some way. Most stabilizing is done with epoxy base and heat added to the turquoise to harden and enhance it so that it will not crack or chip or break when carved. This changes the color and consistency of the stone making it hard to identify what mine it was originally was from although one expert suggested it could possibly be Kingman. All of the heishi and fetish necklaces we sell are made from stabilized stones – otherwise they would crack when drilled or carved. Also stabilizing turquoise preserves its color. It keeps a blue buckle like this from becoming green. But many bracelets and other set stones are made with very hard high grade natural turquoise which is preferred and garners the highest prices. So from highest to lowest value, it would go something like this: high grade natural, stabilized, compressed/fracture sealed, block. So this buckle is not natural untouched turquoise, it is not a block (or manufactured) turquoise product but it some type of treated turquoise in between those two extremes. The highly shiny areas on the face and in between the feather tips show where there is more epoxy in that particular area of the stone. The very clean cut edges, especially along the sides and the edges of the feathers are so smooth that it tells the stone is most likely compressed, fracture sealed stone because even stabilized stone would not have that strong, thick linear edge – it would have a gap or flaking somewhere – but it is very smooth and slick……which means it has been “filled in” or treated quite a bit in one or more methods. It would have to be in order to be carved in such detail and not crack. Bottom line – it is a beautiful, unique buckle and it would HAVE to be made of one of the treated turquoise products so it would withstand carving and use as a belt buckle !!! This is the first in a series of repair articles that I am writing in conjunction with Diane Radeke who is my go-to gal when it comes to repairs. (See her contact information at the end of this article.) We appreciate Diane’s help with this series. Is it possible to repair or restore Native American jewelry? Yes, we have Native American Silversmiths working for us here on premises, who are accomplished artisans and expert repair people. We service repairs for customers and jewelers all over the United States. How can we find out what you can do and how much it will cost? You can photograph or scan your jewelry and email the picture to us. We can usually give you an idea of the repair needed and a ballpark estimate from your photo. If you decide to proceed, you then mail your jewelry to us. Once we receive the item and have a chance to thoroughly inspect it we call you with a firm price for the repairs. 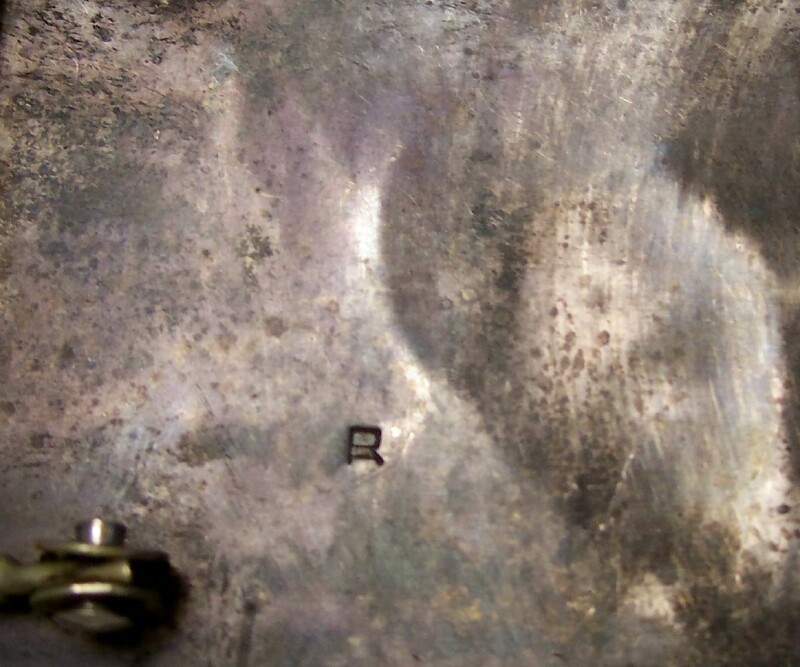 Can you outline the procedure for this inlay buckle repair? Inlay buckle showing missing pieces. From the customer’s picture, we saw that 7 pieces of coral and shell were missing. An estimate for this repair was $85.00 plus $15 to return ship and insure. However, once we received the buckle, we found that the back of the buckle had serious cracks forming in the silver at two edges. It looked like the buckle had flexed back at that point, causing the tearing to begin. All of the missing stones were right on top of the bend – that’s no doubt why they popped out. Back of buckle showing stress cracks from bending. Simply replacing the missing stones was still an option. However, once metal has bent, it “wants” to bend in that very same spot again, causing further damage to the piece. We suggested to the owner that our silversmith could solder a thicker sheet of silver to the back of the buckle, making it much stronger and resistant to any further flexing. Our silversmith removes all of the stones from the front, as well as all of the pieces from the back (the buckle bar, pin, and Massie’s signature plate). He hot solders a piece of sterling silver, cut exactly to size, to the back of the buckle to add stability, and then reattaches everything the way it was. The end result is that the buckle looks exactly the same as it did, just a little heftier in weight. Was there an additional charge for that? Yes. 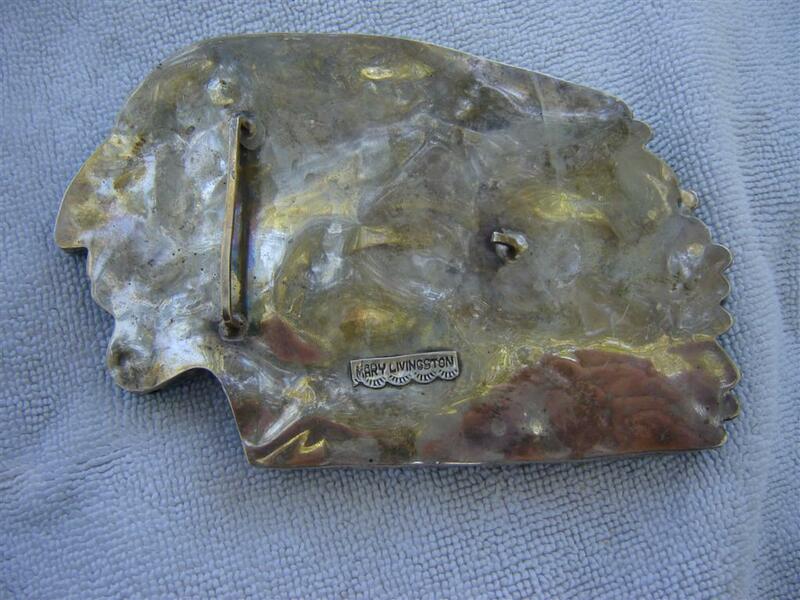 The charge for restoring the buckle in this fashion was $200, instead of $85. The customer decided to have us restore his buckle, as he was looking forward to wearing it frequently. 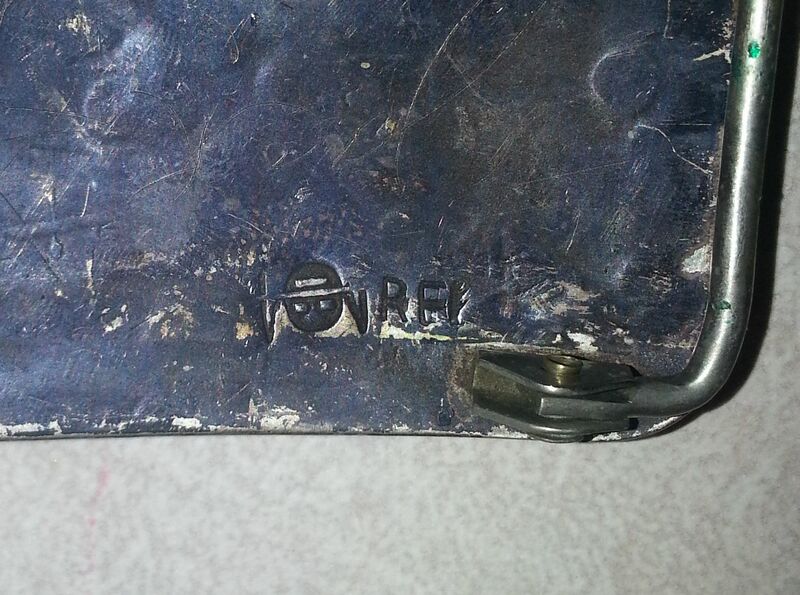 Any information on this well worn buckle? It is of a peyote or water bird – you can read about that symbol by clicking this phrase. It is likely by Tommy Singer, Navajo silversmith. Here are some articles about other Tommy Singer pieces.